1 A None No Power Seat 1 A is a standard Executive seat that may have restricted legroom. The close proximity to the lavatory and galleys may be bothersome. 1 B None No Power Seat 1 B is a standard Executive seat that may have restricted legroom. The close proximity to the lavatory and galleys may be bothersome. 1 C None No Power Seat 1 C is a standard Executive seat that may have restricted legroom. The close proximity to the lavatory and galleys may be bothersome. 1 D None No Power Seat 1 D is a standard Executive seat that may have restricted legroom. The close proximity to the lavatory and galleys may be bothersome. 1 E None No Power Seat 1 E is a standard Executive seat that may have restricted legroom. The close proximity to the lavatory and galleys may be bothersome. 1 F None No Power Seat 1 F is a standard Executive seat that may have restricted legroom. The close proximity to the lavatory and galleys may be bothersome. 10 A None No Power Seat 10 A is a standard Executive seat. 10 B None No Power Seat 10 B is a standard Executive seat. 10 C None No Power Seat 10 C is a standard Executive seat. 10 D None No Power Seat 10 D is a standard Executive seat. 10 E None No Power Seat 10 E is a standard Executive seat. 10 F None No Power Seat 10 F is a standard Executive seat. 2 C None No Power Seat 2 C is a standard Executive seat. 2 D None No Power Seat 2 D is a standard Executive seat. 21 C None No Power Seat 21 C is a standard Economy seat however, the close proximity to the lavatories and galley may be bothersome. 21 D None No Power Seat 21 D is a standard Economy seat however, the close proximity to the lavatories and galley may be bothersome. 22 A None No Power Seat 22 A is a standard Economy seat in the last row of the plane. This seat may have limited to no recline and the close proximity to the lavatories and galley may be bothersome. 22 B None No Power Seat 22 B is a standard Economy seat in the last row of the plane. This seat may have limited to no recline and the close proximity to the lavatories and galley may be bothersome. 22 C None No Power Seat 22 C is a standard Economy seat in the last row of the plane. This seat may have limited to no recline and the close proximity to the lavatories and galley may be bothersome. 22 D None No Power Seat 22 D is a standard Economy seat in the last row of the plane. This seat may have limited to no recline and the close proximity to the lavatories and galley may be bothersome. 22 E None No Power Seat 22 E is a standard Economy seat in the last row of the plane. This seat may have limited to no recline and the close proximity to the lavatories and galley may be bothersome. 22 F None No Power Seat 22 F is a standard Economy seat in the last row of the plane. This seat may have limited to no recline and the close proximity to the lavatories and galley may be bothersome. 3 C None No Power Seat 3 C is a standard Executive seat. 3 D None No Power Seat 3 D is a standard Executive seat. 4 C None No Power Seat 4 C is a standard Executive seat. 4 D None No Power Seat 4 D is a standard Executive seat. 5 C None No Power Seat 5 C is a standard Executive seat. 5 D None No Power Seat 5 D is a standard Executive seat. 6 A None No Power Seat 6 A is a standard Executive seat. 6 B None No Power Seat 6 B is a standard Executive seat. 6 C None No Power Seat 6 C is a standard Executive seat. 6 D None No Power Seat 6 D is a standard Executive seat. 6 E None No Power Seat 6 E is a standard Executive seat. 6 F None No Power Seat 6 F is a standard Executive seat. 7 A None No Power Seat 7 A is a standard Executive seat. 7 B None No Power Seat 7 B is a standard Executive seat. 7 C None No Power Seat 7 C is a standard Executive seat. 7 D None No Power Seat 7 D is a standard Executive seat. 7 E None No Power Seat 7 E is a standard Executive seat. 7 F None No Power Seat 7 F is a standard Executive seat. 8 A None No Power Seat 8 A is a standard Executive seat that may have limited to no recline due to the exit row behind. 8 B None No Power Seat 8 B is a standard Executive seat that may have limited to no recline due to the exit row behind. 8 C None No Power Seat 8 C is a standard Executive seat that may have limited to no recline due to the exit row behind. 8 D None No Power Seat 8 D is a standard Executive seat that may have limited to no recline due to the exit row behind. 8 E None No Power Seat 8 E is a standard Executive seat that may have limited to no recline due to the exit row behind. 8 F None No Power Seat 8 F is a standard Executive seat that may have limited to no recline due to the exit row behind. 9 A None No Power Seat 9 A is a standard Executive seat that has extra legroom due to the exit. 9 B None No Power Seat 9 B is a standard Executive seat that has extra legroom due to the exit. 9 C None No Power Seat 9 C is a standard Executive seat that has extra legroom due to the exit. 9 D None No Power Seat 9 D is a standard Executive seat that has extra legroom due to the exit. 9 E None No Power Seat 9 E is a standard Executive seat that has extra legroom due to the exit. 9 F None No Power Seat 9 F is a standard Executive seat that has extra legroom due to the exit. TAP Portugal adjusts the number of Executive Class seats based on demand. Therefore Executive Class can have as little as no seats and as many as 60, as shown here. Business class seat on new Air bus 319 - horrrible seat construction with no padding - like sitting on an steel auditorium chair for two hours - typical Euro busininess class with same width as economy , however in this case the armrest does not fold down for the middle seat - can not even use this modest mitigation - not impressed . Flew in executive class on CS-TTG and noticed that on this aircraft had universal power outlets between the seats in Row 1 (2 outlets for every 3 seats). For this flight, there was only one row of executive class. I didn't notice any power outlets in row 2 behind me. Note: Executive class on this flight leaves the center seat empty. Meaning there's one outlet per person. I travelled on the cs-ttf in 19f. The seats are new but the pitch is 29 inch and do not recline. There is no power, no jack for audio and no overhead tv in the economy section. I have travelled with tap regularly and prefered the old configuration. For passengers 187cm there is not enough leg room. 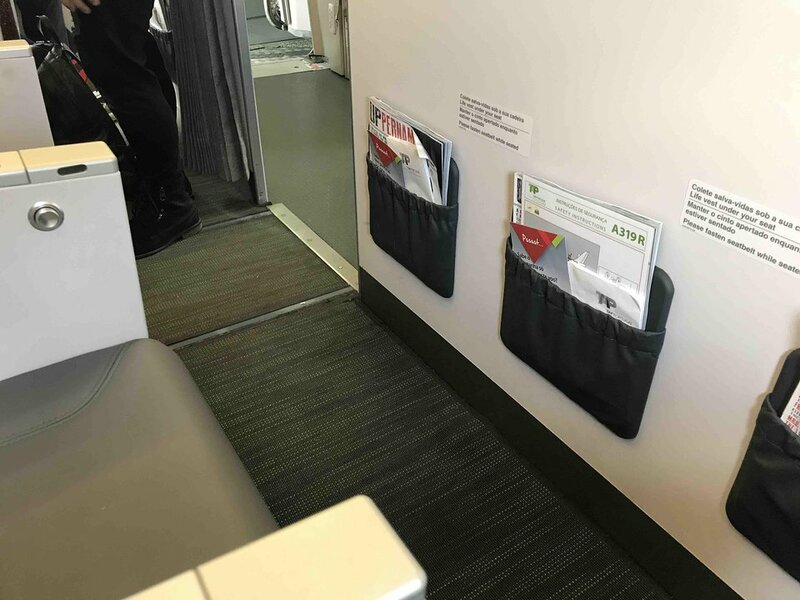 I recently travelled on the refurbished TAP A319 cabin with new slimline seats (registration CS-TTM). It certainly is an improvement over the old seats, adding 2 cm of extra legroom in the same cabin configuration. As the cabin was still new, the seats were OK for the 2h30 flight from LIS to BRU. They might be a problem on longer relations though. The refurbished aircraft have power points for each seat in the Executive/Business section. Economy still lacks power points, so bring a powerbank if you need power.. I understand that TAP is slowly changing their old seats, however if you are unlucky you will still fly in their old cabin. Horrible seats, very old, worn out and dirty. If you sit in the lateral seats the worst part is the shape of the seats as there is a bump in your back. I never flew in an other airplane with the same seats and I can see why! From the moment I took my seat I was uncomfortable however the pitch was above average and also the window does not close being the emergency exit, so if you want to sleep this is not a good seat. You should avoid at all costs, even a short flight will result in discomfort. The exit row is behind, so this seat (8A) does not recline. I flew from Paris-Orly to Lisbon on October 2016. It was an old aircraft, food was served during the flight. I flew from Geneva to Lisbon on the CS-TTI, and have to say that this aircraft is horrible. The seats are disgusting and old, the leather is used and dirty. I am not a very tall person, so I didn't notice any problems with the pitch or width, but my problem was that the seat was too high!! My feet couldn't touch the floor completely, so I flew the entire 2h hour flight in a very unconfortable position. I was in the first economy row, so I had the disgusting separation curtain in front of me all the time, horrible. Well, I flew TAP last year, on November from Recife to Paris with a stop in Lisbon. The two flights were really good, but the last one was amazing! I flew business from Lisbon to Paris, as said above, and the food was terrific, as well as the flight attendants. Thumbs up for TAP Portugal! However, the seats were dreadful, all worned out, but I'm aware that the airline is renewing its aircrafts. I'm flying once again with TAP in 4 months, on the same route with the same airplanes ( so far! ). I can't wait!! We flew this plane from BRU to LIS. I have had my share of long haul flights, so I was surprised to find out that I was more uncomfortable in my seat only one hour in to this 3 hour flight than I have ever been in standard economy after a long haul flight. The seats were very very old and worn down and leg room is very limited. My husband is quite tall and he had serious issues with the legroom. If the person in front of him had reclined his seat he would not have been able to get up. On the bright side, the plane on the way back to Brussels had brand new seats which were alot more comfortable and had more legroom. I think TAP is in the process of renewing the interior of their aircraft which means this one is due any day now. As far as European flights go, TAP is a pretty sweet deal. They didn't charge extra to check a bag and they still offer a meal for free, even on short flights. I had a tuna sandwich and a pear smoothie. Both were enjoyable. Alcoholic beverages were also complimentary, but I can't comment on the wine quality since I didn't have any. Flight attendants did their job, but weren't very nice. They seemed annoyed for some reason. Not happy to be there at all. Would definitely fly TAP again, but only after the interior renewal. Booked economy class, on arrival at airport economy oversold so upgraded to business class along with several others passengers. Same sized seats but much better food.I travel Manchester-Lisbon -Manchester 3 times a year but this was the best flight of all. 1E is slightly wider than the standard economy seat, but no space for hand luggage. This was a lunch time flight. The food was the worst I have ever had in business class. Most passengers left it.